Learn about what CPAP machines do, the pros and cons of using them, and more. Because sleep apnoea interrupts sleep, it often leaves people feeling fatigued during the day. Using a CPAP machine will help reduce the amount of sleep interruptions caused by sleep apnoea, allowing you to feel refreshed the next day. The breathing pauses caused by sleep apnoea can increase your blood pressure. Using a CPAP machine will reduce the amount of breathing pauses experienced throughout the night, thereby lowering your blood pressure. Sleep apnoea can lead to a variety of heart diseases because it disrupts sleep. The pauses in breathing while you sleep increase your blood pressure and can decrease your blood oxygen levels— which is very hard on your heart. Using a CPAP machine helps treat these sleep apnoea symptoms, which decreases your risk of heart disease. Using a CPAP machine consistently will reduce your risk of stroke. People with untreated sleep apnoea are two to four times more likely to have a stroke. Because sleep apnoea can cause irritability or depression, using a CPAP machine will help reduce or prevent these symptoms. Therefore, CPAP therapy can help improve your mood and increase your quality of life. What If I Don't Treat my Sleep Apnoea? Is There Anything I can do to Eradicate Some of the Side Effects from Using a CPAP? Using a humidifier can help alleviate dry nose and sore throat, while making sure you regularly clean your CPAP device will help prevent any illnesses from bacteria, mold, and germs growing in your machine. To make it easier, you can let SoClean do the work. 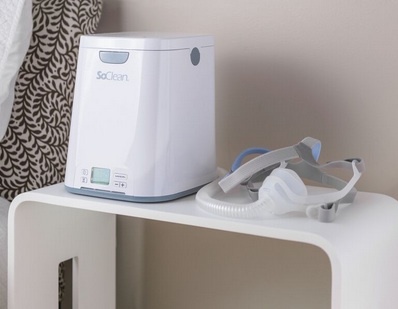 SoClean is an automated CPAP sanitising unit that uses activated oxygen to disinfect your CPAP reservoir, hose, and mask. This means there is no soap and water involved, no drying time, and no need to disassemble your CPAP machine. To learn more about SoClean and its benefits, click here.